A common reaction of local municipal governments to medical and recreational marijuana laws is to enact moratoriums, thus preventing licensed shops from opening. 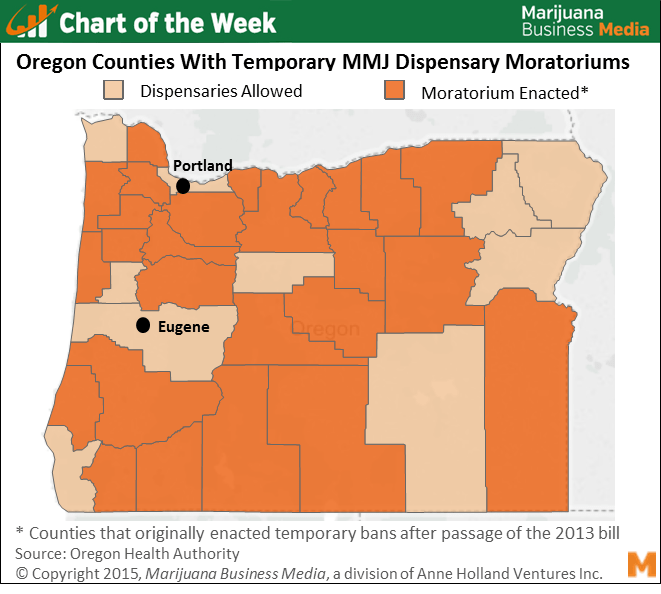 One case in point: 72% of Oregon’s 36 counties enacted temporary bans on medical marijuana businesses following passage of the state’s dispensary law in 2013. Businesses operating in the affected areas lost the legal gray area in which they operated and were forced to close until the local governments set up regulations. In some cases, those rules have been issued, bans lifted, and the businesses have resumed operation. However, in most of Oregon’s counties, shops remain in limbo. Business owners have experienced hundreds of thousands of dollars in revenue losses while they’ve had to maintain expenses such as lease payments. Many had to lay off staff, in turn impacting the local economy. Currently, only one third of Oregon’s residents live in communities where shops are currently allowed to operate, which leaves an estimated 47,000 Oregon MMJ patients without local access to dispensaries. The bans are due to expire May 1, 2015. However, it’s unclear if many of these counties will then be open for business, or under what circumstances. The situation has led to conflicts between state and local jurisdictions, and cannabusiness owners have been left holding the bag. The passage of Oregon’s Measure 91 in 2014 for recreational marijuana has thrown another wrench in the works. The state Health Authority continues the rulemaking phase for recreational marijuana retailers, so it’s not yet clear how these suspended businesses will be impacted. There are several examples of similar messes across the US. For example in Massachusetts, more than 50 towns enacted moratoriums. Likewise 65% of the Colorado’s counties representing 59% of the state’s population do not have local access to medical or recreational shops. In the end, despite majority voter enthusiasm for MMJ and recreational bills in these states, the reality of implementation is often quite complicated. Becky Olson can be reached at [email protected].